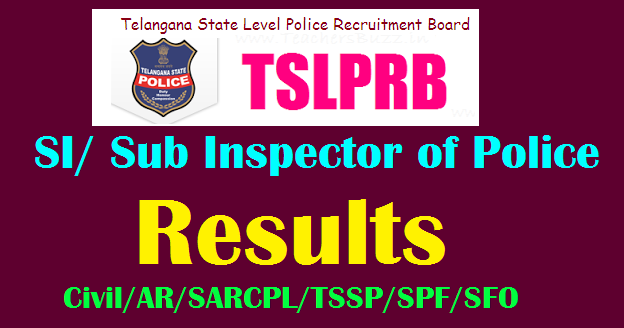 TSLPRB| TS SI/Sub Inspector of Police posts Results 2018 TS SI (Civil/ AR/ SARCPL/ TSSP/ SPF/ SFO) Results 2018 TS SI (Communications)Results 2018: TS SI SI/Sub Inspector of Police posts Results 2018 Released. Telangana SI posts 2018 Results, TS SI Results 2018, Results of SI posts 2018. Telangana State Level Police Recruitment Board, The Director General of Police, Telangana State given SI Posts 2018 recruitment notification on 30th May 2018 to fill up vacancies. Applications are invited through ONLINE mode only in the prescribed proforma to be made available on WEBSITE (www.tslprb.in) for recruitment to the following posts. The registered candidates may download their Hall Ticket one week before the date of Preliminary Written Test, which will be held in sept 2018. Telangana State Level Police Recruitment Board had issued a Notification on 31-05-2018 for the direct Recruitment of 29 vacancies of SCT Sub Inspector of Police (IT&C) and 26 vacancies of SCT Assistant Sub Inspector of Police (FPB). 13,933 Candidates were to appear for the Preliminary Written Test of SCT SI (IT&C) and 7,694 Candidates were to appear for the Preliminary Written Test of SCT ASI (FPB). The Preliminary Written Tests were conducted smoothly, by scrupulously abiding by all the norms and regulations, on 9th September 2018 with the attendance of 10,809 (78%) in the Written Test of SCT SI (IT&C) in the morning session and 6,013 (78%) in the Written Test of SCT ASI (FPB) in the afternoon session. Preliminary Keys for the above Tests were made available on the official website: www.tslprb.in from 19-09-2018 onwards. Candidates were given an opportunity to submit Objections on the Preliminary Key before 5 pm on 21-09-2018. After resolving all such Objections and related issues, the Final Keys has been arrived at, which are now made available on the Home Page of www.tslprb.in. Preliminary Written Test of the Notification. Telangana State Level Police Recruitment Board(TSLPRB) has successfully conducted the Preliminary Written Test for TS SI/Sub Inspector of Police Posts at Hyderabad. TSLPRB has Released Results of SI posts and kept on TSLPRB web portal.Get Results from Below links. The Average Mark of the PWT of SCT SI (IT&C) is 65.75/200 (32.87 %), the Highest Mark Scored is 143/200 (71.5 %) and the Lowest Mark is 16/200 (8 %). The Modal Mark – 64/200 (32 %) is scored by 566 of the Candidates. Telangana State Level Police Recruitment Board had issued a Notification on 31-05-2018 for direct recruitment of 1217 vacancies of SCT SI Civil and / or equivalent Posts. 1,88,715 Candidates have registered for the said Recruitment and after de-duplication of Applications, total Candidates fit to appear for the Preliminary Written Test was 1,88,482. The Preliminary Written Test for the Recruitment of SCT SIs Civil and / or equivalent Posts was conducted smoothly, by scrupulously abiding by all the norms and regulations, on 26th August 2018 with the attendance of 1,77,992 Candidates (more than 94 %). Preliminary Key for the above Test was made available on the official website: www.tslprb.in from 27-08-2018 onwards. Candidates were given an opportunity to submit Objections on the Preliminary Key before 5 pm on 29-08-2018. After resolving all such Objections and related issues, the Final Key has been arrived at, which is now made available on the Home Page of www.tslprb.in. OMR Sheets of the Candidates who have attended the Preliminary Written Test have been evaluated and based on the marks obtained by the Candidates, the list of Qualified Candidates has been drawn as per the norms delineated in Para 18. Selection Procedure / Scheme – A) Preliminary Written Test of the Notification. by the Candidates by logging in with their respective Usernames. The Schedule for filling-in the Part-II Online Application Form will be informed in due course. Candidates who are declared qualified in the Preliminary Written Test have to visit the website www.tslprb.in for uploading the Part-II Application along with scanned copies of the required Certificates / Documents as elaborated in Para 7. Instructions to Candidates for Filling the Part-II Online Application Form and Uploading in the Notification. Physical Measurement Test and Physical Efficiency Test with details of Venue, Date and Time. For all the relevant Candidates pertaining to the Notification Nos. 88, 89, 90 and 91 / Rect.